My son gave this book to me for Christmas, I appreciate his choices as they have tended to provide much of my Summer reading over the last few years (he gave me Merchants of Doubt last year). 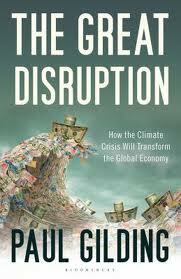 I think I will have to add The Great Disruption to my list of essential reading for activists. Australian writer Paul Gilding has had a broad and successful career in academia, environmental and social activism and in business. He is currently a member of the core faculty for Cambridge University's Programme for Sustainability leadership. Gilding has a blog that has readers from all around the world. While Gilding believes that we are approaching economic and environmental collapse he is upbeat and looking forward to both. Despite growing up and developing his understanding of the world through the likes of Thoreau, Rachael Carson and Prof. Jorgen Randers, Gilding is upbeat about the future of the planet and the human race. He believes that humans respond well to crisis and are hugely resourceful and although we have delayed acting properly on the obvious failings of the world's economy or fully addressing environmental degradation, it is not too late. Gilding doesn't subscribe to the view that humanity will fight over the last scraps of valuable resources and cause the world to fall into total environmental collapse. He believes that the noble and decent elements within most of us will triumph and that communities and nations will collectively meet the challenges in a manner that will see us eventually living in a better world. He called the book The Great Disruption because he thinks that there will be a disruption and a number of crises that we will have to experience but these will cause us to rally as we have done in times of war. What is also reassuring is that when that time comes where action is needed we already have much of the knowledge to put things right. The economic and environmental models largely exist that can be applied to solving the problems that we will be faced with and we just have to shift our thinking to accommodate them. My last post for 2012 was probably a little depressing and I hope this one provides a more upbeat tone. Rather than seeing our National led Government as one that is leading us to imminent disaster, perhaps they are actually providing a quicker path to a crisis that will enable the positive change that Gilding talks about. We should be saying "bring it on" to celebrity Key and his ideologically determined mates.